Kenchō (建長) was a Japanese era name (年号,, nengō,, lit. "year name") after Hōji and before Kōgen. This period started in March 1249 and ended in October 1256. The reigning emperor was Go-Fukakusa-tennō (後深草天皇). 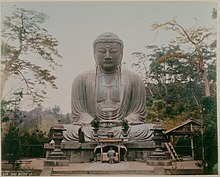 1252 (Kenchō 2): Great Buddha of Kamakura was put in place at Kōtoku-in. 1253 (Kenchō 5): Kenchō-ji founded. ↑ Nussbaum, Louis-Frédéric. (2005). "Kenchō" in Japan encyclopedia, p. 508. ↑ Tsubata, Kate. "The Great Buddha at Kamakura," The Washington Times, May 25, 2008; retrieved 2012-4-30. ↑ Joint Council for Japanese Renzai Obaku Zen, Kenchō-ji; retrieved 2012-4-26. This page was last changed on 25 December 2018, at 02:14.